Stretch bracelets are fast and easy to make. Another plus is that they can be as casual or elegant as you'd like. 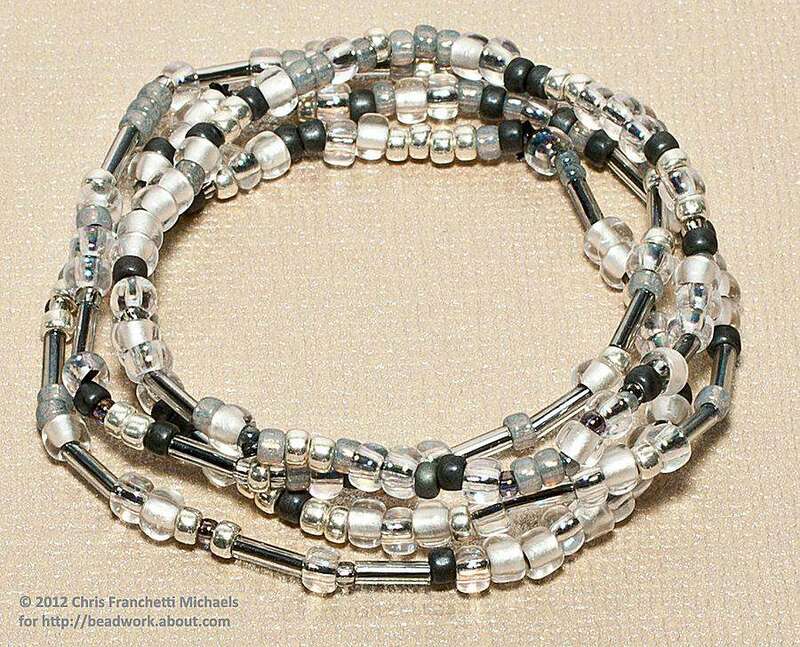 Stretch bracelets can also be very economical when made with seed beads or leftover beads from other projects. Best of all, they look great stacked together! Get ready to make an armful of stretch bracelets. A completed stack of stretch bracelets using a mix of Toho glass seed beads. This tutorial will show you how to make stretch bracelets with seed beads. When you choose beads, select ones that are lightweight and don't have sharp edges around the holes. Seed beads work well because their small size makes them lightweight and most have very smooth holes. You can also use plastic beads, including vintage Lucite beads, pony (kanji) beads, or designer acrylic beads from a bead store. Many kinds of wood and shell beads also work nicely. Just make sure the beads have smooth holes to avoid cutting or wearing away the elastic cord. Not everyone agrees with using glue on the knot of elastic bracelets. Some people say it makes the cord brittle and more prone to breakage. That is not my experience. When choosing a glue you may want to consider that super glue is by far the fastest-drying option, but it makes it more difficult to hide your knot and makes it easy to accidentally glue your fingers together. You may prefer to use something more slow-drying like E6000 and then simply allow them to dry before wearing your bracelet. Cut a length of cord that is about four to six inches longer than your desired bracelet length. Affix a bead stopper about three inches from one end. Pre-stretch the elastic cord by taking a length about 3 inches long and stretching lightly, move down and stretch the next section until you have pre-stretched the entire length. This will prevent your stretch bracelet from sagging. For my bracelet, I'm using 0.5mm black stretch floss cord. Unless your beads are large enough to string without a needle, thread a collapsible eye or big eye needle onto the other end of the stretch cord and fold over a two-inch tail. This step is optional if you're using beads with very large holes; in that case, you can often string them directly onto the cord. String all of the beads for your bracelet. Check the length occasionally by wrapping the strung beads around your wrist. Be sure to leave a little space between your skin and the bracelet, so that you can roll it over your wrist without breaking the stretch cord. This also helps to ensure that no areas of the empty card show through. Make sure that the last bead you string has a hole large enough to hide a knot in your beading cord. If you plan to make a stack of bracelets using the same beads, measure your stand now and jot down its length so that you can replicate it. If you make another bracelet using smaller or larger beads, you should check for fit again with those, because you may need the bracelet to be slightly shorter or longer. When you are working with small beads like these that are all the same size, mixing in a few beads with a larger hole will make it easier for you to hide the knot. Knotting your stretch bracelet takes the most practice. The ends can be slippery and the last thing you want is to drop the cord and see all those fabulous beads slide off the end! For stacking seed bead bracelets, we generally use a square knot because it hides inside the beads better. When we are making gemstone bracelets, we tend to use a surgeon's knot, which we find is a little bulkier but more secure. Remove the bead stopper and the needle from the elastic cord, and then bring both ends together. Carefully make the first half of a square knot, gently pulling the cord ends to remove slack in the bracelet. Do your best to hold the first half of the knot in place, and then tie the second part of the knot and pull firmly to secure. It can be tricky at first to complete a knot without losing tension in the bracelet and allowing spaces to form between the beads. If you do lose tension, try pulling both ends of the cord away from each other to take up some slack. After completing a few bracelets, this should become much easier. Some people use crimp beads, rather than knots, to secure the ends of the stretch cord. We don't recommend that method because the sharp metal edges of the crimps are likely to cut the cord. While holding the bead away from your knot, apply a tiny drop of glue to the knot. With the glue still tacky, hold the cord between two beads about an inch away from the knot, and tug gently to pull the knot inside of the adjacent bead. Let the glue dry before trimming the cord ends. This will make it less likely that the knot will loosen when you are trimming them. Once the glue has dried, very gently, stretch out each cord end, and then use embroidery scissors to trim the end close to the beads. Once the glue has dried, your new stretch bracelet will be ready to wear. In the meantime, you can make a few more bracelets to wear stacked, and even string up some shorter matching finger rings. While beaded stretch bracelets are economical and fast to make, they do not last forever; eventually, your bracelets are likely to break.